Cucumbers can be a very abundant garden harvest. We eat them fresh by the bushel and can up dozens of quart jars of pickles and yet there are still so very many. 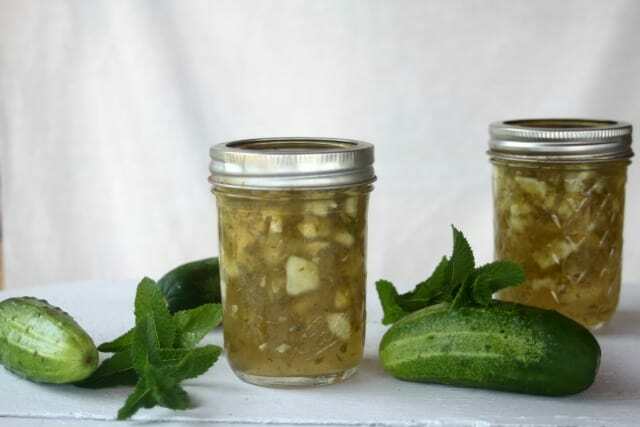 Cucumber mint jam is a fun, tasty, and unusual way to use a few up. Use pectin in this recipe instead of cooking until gel point is reached. A long cooking to reach gel stage is going to cook the cucumbers to death and likely leave a watery final product. Keep it quick with the addition of commercial pectin. Cucumbers are a low-acid vegetable. The addition of sugar and vinegar is key to raise the acidity level for canning. As much as I prefer a low-sugar jam, this is not the place for it. The vinegar helps with acidity and mellows out the sweetness giving the final jam a great sweet and savory combination. 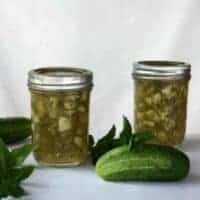 Pickling cucumbers tend to have less water than the slicing/salad types. It is for this drier texture that I choose to go with pickling cucumbers in this jam. One could try using slicing cucumbers but the additional water might make the final product a little less firm than a traditional jam. 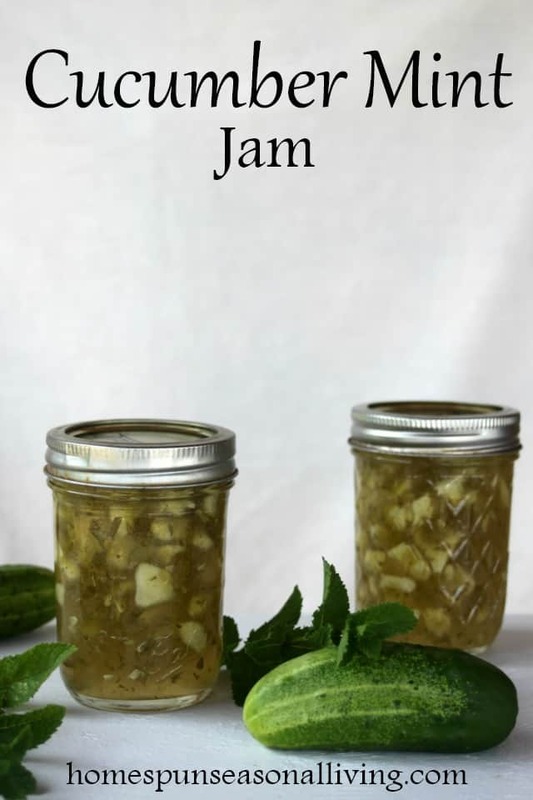 Before all those summer cucumbers fade away consider whipping up some jam with this easy and quick recipe. Make the most of an abundant cucumber harvest with this deliciously unusual and oh-so-easy- cucumber mint jam recipe with canning instructions included. In a large pot, combine cucumbers, lemon juice, apple cider vinegar, and pectin. Bring to boil, mashing slightly with a spoon. Keep at a rolling boil for 1 minute. Add the sugar, all at once and bring to a boil again. Boil for 1 minute. Remove from heat, skim off foam. Stir in mint. Pour into jars, leaving 1/4" headspace. Process for 10 minutes (adjusting for elevation) in a boiling water bath. Sounds interesting! How much does this recipe yield? About 6 half pints. I can’t believe I forgot that in the recipe. Enjoy! I am excited to try this. Can lime juice be substituted for lemon juice, or maybe a lemon/lime combo? I didn’t try it but I don’t see why not. Sounds like a keeper. Must try.. I just made this today using cucamelons in place of the cucumbers. I halved the recipe just because I wasn’t sure, but now I wish I had made the whole recipe. It was fantastic! Thanks for a great recipe!! Oh I’m so glad to hear that you enjoyed it! It is a different flavor, I’m sorry to hear you didn’t like it. Just wanted to let you know that I came across this recipe last year and made it — and now I’m going to make it every year. Everyone we gifted with this jam LOVED it. Thank you for putting it out there! Thank you so much for letting me know. I’m so glad to hear that it was such a hit! Any reason that you can’t mix pickling cucumbers with salad cucumbers when making jams? I don’t see why you couldn’t mix the two. Salad cucumbers tend to have more water so it might affect how well it gels but for sure it would work flavor wise. I made this today and have to say that it is AWESOME!!! Everyone loved it! Will be making this again for sure! Love the mint! Your recipe should be the perfect topper, I’ll let you know how it goes! Yum! Good luck. I can’t wait to hear how it goes. I made this yesterday, it tasted good but it didn’t thicken up. It is more like a syrup. What did I do wrong? It’s hard for me to say exactly. There are many different reasons why jam doesn’t set… was the pectin old. Are you sure you kept it at a full rolling boil (a boil that can’t be stirred down) for a full minute after adding the pectin? Did you add the sugar all at once? try letting the jars sit for a week or two or more. Lately I have experienced pear jam and plum jam that appeared too runny at first but when using them a month later – they were set up just fine. In fact I had designated a few jars of pear jam as “pear syrup” as they were too runny to qualify as jam. Upon opening them, I found they had turned into the perfect jam consistency. I made this today! I grated the cucumber instead of chopping and used lime juice instead of lemon. Ots tangy and delicious on cream cheese and crackers! Oh, I’m so glad to hear it and what a good idea to grate it! Just made my second batch of this yesterday. It is so good! Told my husband about it. He said, “that sounds disgusting”. Let him taste a little today as I was jarring it up…”okay, I was wrong. That is really good”, was his response. I have over 30 jars of bread and butters left from last year and have already put up over 20 jars of dill pickles this year. So, I am very grateful for another canning option for cucumbers. Thank you!! I’m so glad to hear this, thank you! Enjoy. Can you use liquid pectin instead of power if so how much liquid. I’ve never tested it that way, so I don’t know. I’m sorry I can’t be more help. I was wondering if you could make this jam into a jelly, by straining it? I’m sure you could but I’ve never tried it. If you do give it a go, let us know how it turned out for you. Can I make this and not do the bath at the end and just eat it up fresh? Sure, Just keep it in the fridge instead of on the shelf.